Here you will find a brief overview of the history of the formation of Flathead County and a description of records unique to the Flathead that may be of use to individuals researching their genealogy in our area. FVGS is not responsible for either the maintenance or content to webpages that we provide hyperlinks for, they are provided as a courtesy to our visitors as they contain genealogical information useful for our area. Flathead County was organized in 1893 and originally included all of present day Lincoln County (1909) and the northern part of Lake County (1923). Prior to 1893 these three counties belonged to Missoula County, one of Montana's nine original counties. The Montana territorial legislature passed the first law requiring the registration of marriages in 1864 and, while most counties attempted to comply, the large geographical coverage of counties in Montana prior to 1900 made registration sporadic. Flathead marriages begin in 1893 with the counties creation and are currently available online with other Montana county marriage records to 1950 through FamilySearch and they are indexed. In 1895 the state legislature passed the first law requiring counties to record records of birth and death. This law was replaced with a new vital records act in 1907 that made it mandatory and required copies to be forwarded to the newly established Department of Health. Full compliance with the 1907 law was not reached until about 1920. While some counties utilized a ledger format to record the events, Flathead County has always used certificates. 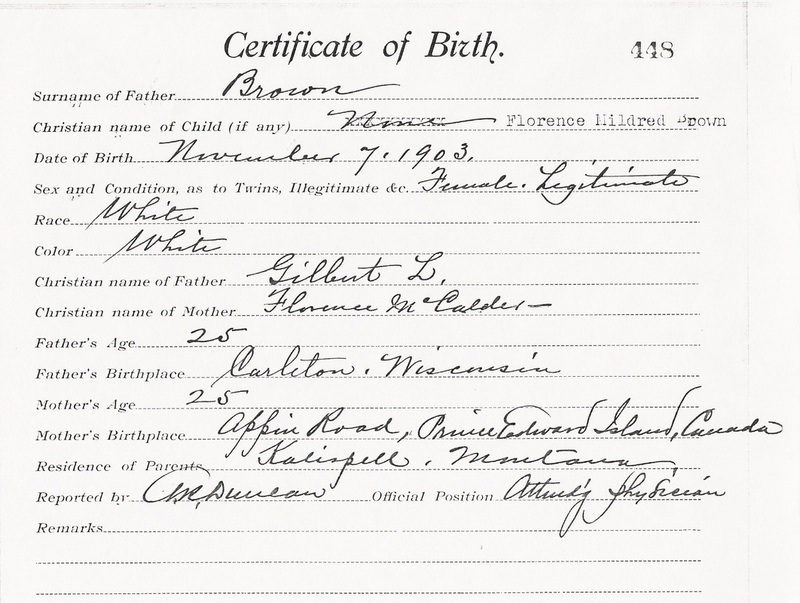 The image on the left is the typical pre-1907 format for a birth certificate. While early Flathead birth records record important information for genealogists, early death records only recorded the individual's name, date of death, cause and place of death, age and sometimes place of birth and whether the decedent was married or single. Information on parents was not included. Currently only Lake County death records in our area are online through Family Search under Lake County Miscellaneous records. They are not currently indexed. Major religious denominations in the early years of Flathead County included the Methodist Episcopal Church, the Lutheran Church, the Presbyterian Church, the Roman Catholic Church and the Episcopal Church. Most of these denominations' records are still in the possession of the local parish. The Daily Interlake was one of the first newspapers established in Northwest Montana in 1888 at Demersville, the first incorporated town north of the City of Missoula. Most editions of the paper are extant and have been microfilmed and available either at the Flathead County Library for viewing or by interlibrary loan. If you have access to newspaperarchives.com either by subscription or through your local Family History Center at a local LDS church, the Daily Interlake has been added and indexed. However, the indexing is not always accurate and you can manually search through editions. Other early newspapers included the Columbian, 1891-1897 and 1905-1925, that covered the Columbia Falls area, The Whitefish Pilot, 1904-Present, covering the Whitefish area and The Kalispell Bee 1900-1918. These papers and the Interlake had their vital information indexed by Leanord J. Turnacliff from 1893-1910 titled "Index of Papers of Kalispell, Montana." A copy is available at Flathead County Library, call number 978.682 Turnacliff, as a reference item. The cemeteries of Flathead County have been indexed up to 1980 in a two volume series. Volume one covers the C E Conrad Memorial Cemetery, while volume two covers rural cemeteries and miscellaneous burials. Copies are available at the Flathead County Library and Missoula Public Library as reference items, and copies are available for interlibrary loan. The call numbers are 978.682 Flathead Vol. 1 and 978.682 Flathead Vol. 2. Much of the information in these volumes are online through the Montana GenWeb and by searching FindAGrave.com. Flathead County and Northwest Montana benefited greatly from the Homestead Act of 1862 and homesteading continued well into the 1920s. While the Flathead County Clerk and Recorder and the County Surveryor's offices only include copies of the land patent, you can search the public land patent database at the Bureau of Land Management website. If your ancestor has a homestead patent, rather than a cash purchase of public lands, you may wish to send for the accompanying records from the national archives or BLM office. Items you may find may include information on the date and location of the applicants marriage, family members and place of last residence. However, each homestead file is unique and may include no additional information or may include additional documentation useful to genealogists. Currently, FamilySearch has probate records to 1950, Divorce records 1914-1929 and Deeds with Grantor Index from 1872-1927. The images are not indexed but may be manually searched. For Lake County, FamilySearch has the Divorce Index from 1914-1958, School Records 1910-1980, Probate Index 1923-1950, Property Records 1923-1940, Death Records 1923-2010, and some Naturalization Records. None of these images are Indexed. 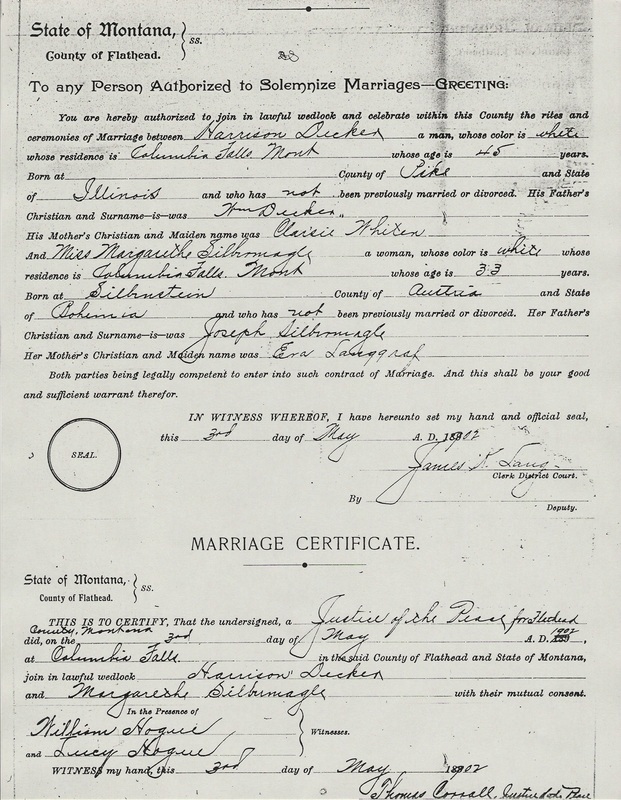 Montana marriage records are online at FamilySearch from 1864-1950 and the images are Indexed. FamilySearch also has a statewide death index. Below are links to the FamilySearch webpages with these documents. We are also providing a link to the Bureau of Land Management Land Patent Database.